A Smile Makeover Can Build Self Confidence and Boost Your Self Esteem! If you’ve ever felt low self-esteem because of cracked or discolored teeth, let us solve that problem for you with a high-quality smile makeover. The modern world of cosmetic dentistry provides patients with greater options than ever before that allow them to have the smile they’ve always dreamed of. 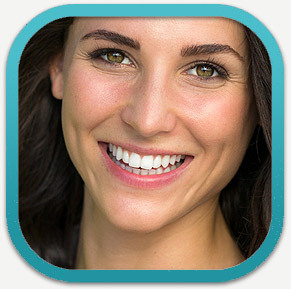 There are a variety of cosmetic dental procedures Dr. Heidari provides here at Serenity Dental Palo Alto. These include restorations for broken or chipped teeth using dental implants, bridges or dental crowns, as well as solutions for misaligned or discolored teeth like porcelain dental veneers, teeth whitening and Invisalign clear braces. Before we begin the process of giving you a smile makeover, we conduct a complete examination of your mouth and then, based on our findings, speak with you about the options that could best fit your needs. Upon a quick background check of your overall health, we can then begin the treatment. Many of your facial features impact the type of makeover we can give you, including the color of your hair and skin, your overall facial appearance, the shape of your teeth, your gum tissue and your lips. Dental crowns and porcelain veneers that perfectly blend in with these features are a couple of options we may use to give you an attractive smile. We understand that having a smile makeover could really boost your self-esteem, and it is our goal to see every single one of our patients leave happier than they came in. Let us give you the smile makeover you deserve. Call our Palo Alto dental office today at 650.327.7525 or email us at APPT@PaloAltoDentistry.com. If you are in or around San Jose, please visit our San Jose Smile Makeover page or call our office at 408.999.0444. We’re happy to answer any of your questions. We also offer smile makeovers in Aptos, Santa Cruz, Capitola and Soquel. Please visit our Aptos Smile Makeover page or call our office there at 831.688.6531 for more information.